The wassail bowl dates back at least 600 years. In the kings court, the bowl would be passed from person to person. 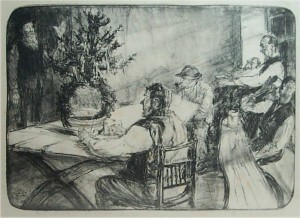 Take a sip, then pass it on to the next, wishing them a healthy new year. 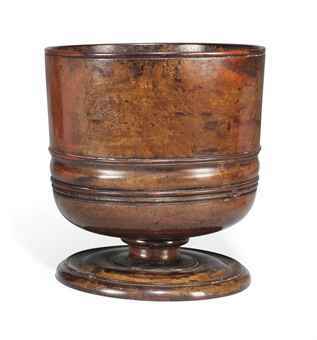 By the C17th it was common practice to take the bowl around to your neighbours and wish them a healthy new year – and maybe chant a wassail rhyme, or sing a wassail song to bring them good fortune. Wassail bowls can be ceramic or wood. Some are very elaborate, but others were just an ordinary maple bowl from the dairy. In the C19th some of these bowls were decorated with greenery and ribbons. Locally there was a tradition of attaching iron hoops to the bowl so that the greenery could be fixed on making it more spectacular. 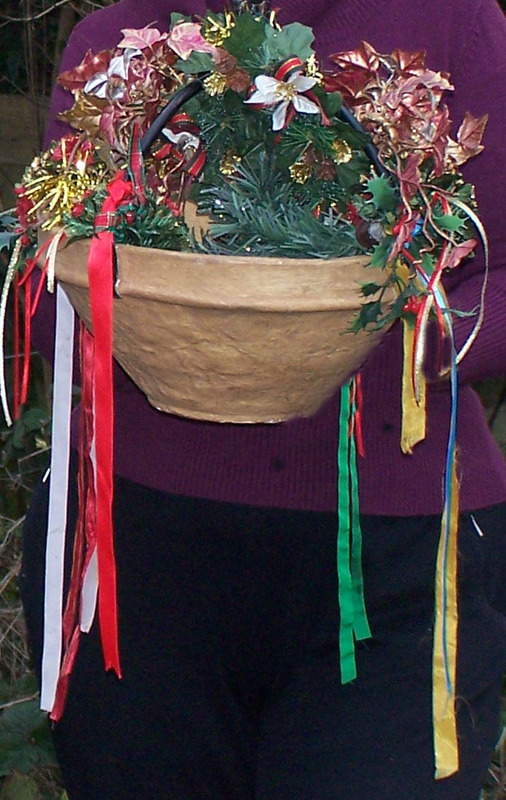 This may be a conjunction between the wassail bowl and the wassail bough (a kind of christmas tree in a pot) that was carried by wassailers in some areas. What goes in the Wassail Bowl? There are many recipes for the brew, these recipes vary by geography and through time. Many recipes offer a mulled wine, ale or cider, sometimes a mixture of all three! In some places it was traditional to top the brew with ‘lambswool’. This is a delicious confection of whisked up pulp of baked apples. In the C19th & C20th in the southern part of Gloucestershire, the tradition for fixing hoops to the bowl made it impractical to hold the drink, and it was sometimes used to collect money.